I never rarely go to garage sales any longer. After all, don't I have enough crap treasures in my own home, do I really need to go buy more? Now you will see why I can't drive around town unattended, I end up bringing home more "stuff". I rarely find anything sheep related that is older and unique....But once in a while.........I hit the jackpot and this is one of those times. This little antique pottery piece cost me a whopping $7.50 and I love it. It's about 7" long and 7" high and approx. 4 1/2" wide. It's like a mini soup tureen. Can anyone tell me what this might have been used for originally? 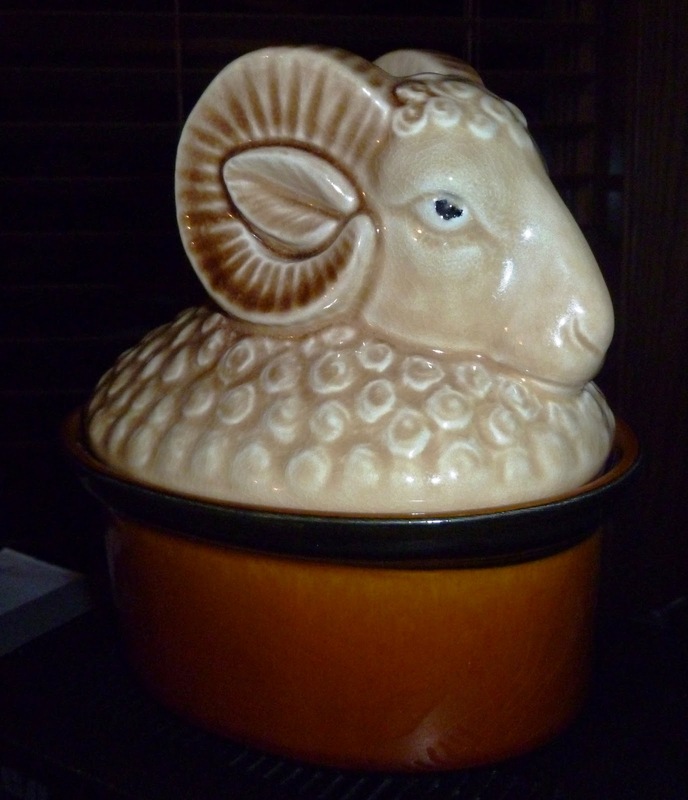 I have a hard time believing it was a soup tureen, it's pretty small. What a great find! I love finding sheepy things. Could it have been a butter bowl? I don't know what it was for either, but I love it! Gives me ideas for making something like it out of felt. Very nice! Do you have any idea of its age? How about a ring box or jewelry/keepsakes? Looks like in great condition! Not sure how of the age, and it seems a bit larger than what you'd find for a jewelry box. I'm thinking it seems about the perfect size for a butter bowl, like Voni had suggested. That seems to be the most plausible description so far. I'm thinking butter bowl too Voni. Too wonderful. I am a dreadfully reluctant consumer and not a collector by any stretch but this one would have had to come home with me too. Nice find! It is called a cassolettes and is used for just that. I have included a recipe for your information. This chicken and sausage cassoulet recipe is a modern update on the classic white bean cassoulet from Toulouse. This version evokes particularly complex and developed flavors by cooking certain ingredients separately, and then together. The result is an irresistible, hearty stew. Place the beans in a large saucepan and cover them with cold water. Bring the beans to a gentle simmer over medium heat. Cover and cook them until they begin to turn tender, about 1 hour and 15 minutes. Add 1 teaspoon salt and 1/4 teaspoon ground black pepper to the beans and cook until the liquid has absorbed, about 25 additional minutes. Remove the beans from the heat, drain and discard any additional liquid, and set the beans aside. In a large skillet over medium-high heat, cook the lardons for 5 minutes, until they turn brown. Transfer them to a plate. Add the onions to the pan and sauté them for 10 minutes, until they turn light golden brown. Transfer them to the plate with the lardons. Brown the sausage and transfer it to a bowl. Preheat the oven to 350F. Drain all but 4 tablespoons of the fat from the skillet. Add the chicken breast pieces to the fat and brown them over medium-high heat. Transfer the chicken to the bowl with the sausage. Brown the chicken legs in the skillet and transfer them to the bowl. Combine the lardons, onions, sausage, chicken pieces and legs, tomatoes, wine, chicken stock, bouquet garni, garlic, tomato paste, 3/4 teaspoon salt, and 1/4 teaspoon ground black pepper in a large casserole dish. Cover with a lid or foil, and bake the casserole for 25 minutes. Add the carrots to the casserole, cover, and bake for an additional 20 minutes. Add the reserved white beans to the hot casserole and gently stir the mixture. In a small bowl, toss the bread crumbs, parsley, and thyme with the melted butter. Sprinkle the seasoned bread crumbs over the casserole and bake it, uncovered, for 1 hour. Discard the bouquet garni and serve the cassoulet hot. This chicken and sausage cassoulet recipe makes 12 large servings. Your cassolette is worth approx 150.00 US dollars. Enjoy and keep finding special treasures!